We did it – It’s Our Land! In other words the margin of both LC’s victory and D’s defeat are growing! We did it! Measure LC passed and measure D was defeated. 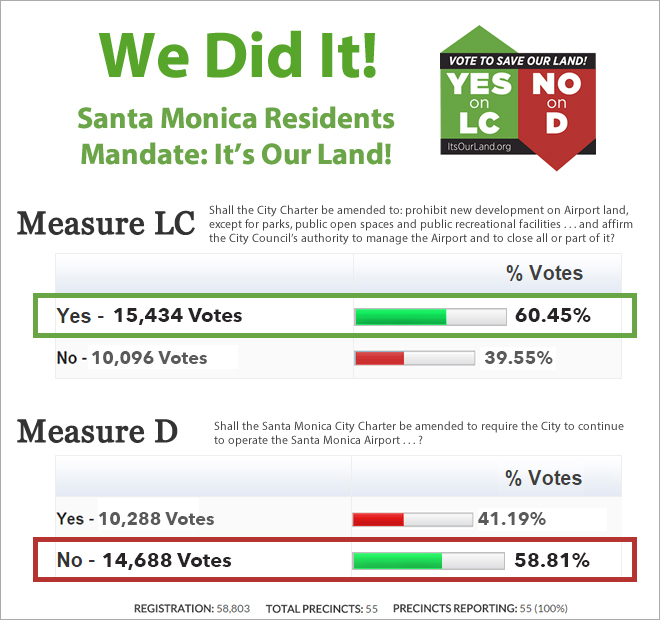 The margins on both were huge, so we see this as a mandate from the people, and we will keep working to ensure the people control the future of the airport land. I would like to thank everyone that was part of this history making success. All of you who so generously donated to our campaign, your money could not have been better spent. Thank you! To all the people, community leaders, candidates, elected officials, and organizations that endorsed us and in many cases helped get our message out in their own mailings and material. Thank you! To all of you on this list who volunteered in so many different and important ways to make this a broad and balanced city-wide campaign that will become a model for all that follow to try to emulate. Thank you! To all of the core volunteers that worked so tirelessly. Zina Josephs and all her amazing team on outreach and endorsements, phone banking, leafleting, and so many other things I can’t list them all. Susan Hartley and all her indefatigable canvassers who relentlessly covered every street in this City. Andrew Wilder, Brian Bland, Gavin Scott and everyone in the media group for all their amazing work to bring our message to the people. Vivien Flitton, Cathy McCabe, Lisa Sandbank, and all the events group team for all those house parties, events, and organizing, especially the final election day deployments. Thank you! To our executive committee of Michael Brodsky, Mike Salazar, Cathy Larson, Neil Carrey, and Frank Gruber: thank you for making this one of the most flawlessly executed campaigns ever. For quick decisions, fire fighting, and adaptability as circumstances and finances unfolded. Thank you! To our incredible political consultant Sharon Gilpin for all her sage observations, calm council, and impeccable instincts, polling, message crafting and mailers. We could not have done this without you. Thank you! To all the people whose names I should have mentioned but haven’t in my haste. Thank you! Last but not least, thank you to all the people of Santa Monica for your perspicacity in distinguishing lies from truth and voting accordingly. You were the David in this battle, AOPA, NBAA, and their ilk were Goliath, and the volunteers of the “Its Our Land” team were merely the sling and stones. It has been an honor to serve with you all. This campaign is one for the record books. We have won a pivotal battle in the war. The tide was already turning our way, so our opponents played a desperate gambit and lost. The “Its Our Land” team may take a well earned rest, but be assured this war is not over yet, and we will not rest until our victory is complete. Forward to a brighter future, one that we the people control! The people have spoken and we have our mandate.